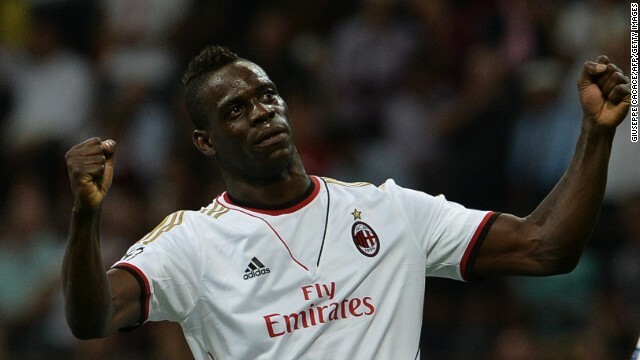 Mario Balotelli celebrates scoring Milan's second goal against PSV in the Champions League. (CNN) -- Seven-time European champions AC Milan breezed into the group stages of the Champions League with a 4-1 aggregate victory over Dutch side PSV Eindhoven. The continent's top club competition would have seemed inconceivable without the Italian giants but they made light work of their youthful opponents at their San Siro stadium. Two goals from Kevin-Prince Boateng and one from Italy striker Mario Balotelli secured Milan's passage to the lucrative group stages. After suffering defeat in their opening Serie A game at the weekend to Hellas Verona, Milan restored some pride and ensured they will be in the hat when the draw is made on Thursday. If Milan enjoyed a comfortable night, Scottish champions Celtic had to secure their passage the hard way after coming back from a 2-0 first leg deficit to beat Shakhter Karagandy from Kazakhstan. Shakhter were prevented from conducting their usual pre-match ritual of sacrificing a sheep and were hit by two goals either side of halftime as Kris Commons and Georgios Samaras leveled the tie. And just as it looked like extra time was inevitable, James Forrest finished off a cross from Anthony Stokes to send Celtic manager Neil Lennon sprinting the length of the touchline to celebrate with his players. Elsewhere, two goals from Carlos Vela helped Real Sociedad to a 2-0 victory over French side Lyon, the Spanish side winning 4-0 on aggregate. Zenit St Petersburg booked their place with an emphatic 8-3 aggregate victory over Portuguese side Paços de Ferreira, winning 4-2 in Russia. Miguel Danny scored twice. Czech club Viktoria Plzen triumphed 1-0 away to NK Maribor in Slovenia thanks to Stanislav Tecl's goal as they ran out 4-1 winners on aggregate. In England's League Cup -- the third most prestigious domestic title behind the Premier League and the FA Cup -- five top flight clubs were in action. Everton needed extra time to beat third tier Stevenage 2-1, while Aston Villa defeated Rotherham, from the same league 3-0. Newcastle beat Morecambe, from the fourth tier, 2-0 while Cardiff triumphed 2-0 at Accrington Stanley and Stoke beat Walsall 3-1. The draw for the third round threw up a tantalizing tie as Manchester United were drawn at home against Liverpool. It is the first game in which Luis Suarez would be available to play for Liverpool after serving a 10-match ban for biting Chelsea defender Branislav Ivanovic at the end of last season. Suarez was banned for eight games the previous season after being found guilty of racially abusing Manchester United defender Patrice Evra.